*Kalaka [Proto-Polynesian, from Proto Oceanic *kalaka Planchonella (Pouteria) spp. Related name: karakariki (see separate page). 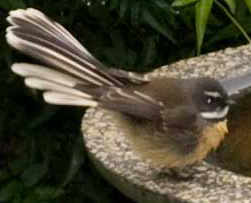 The male tötara is also sometimes referred to as karaka. Because of the cooler climate, which made growing the tropical plants they brought with them (taro, yam, kumara, Polynesian tï, and the hue) difficult in many places and impossible in some, the early Polynesian settlers were faced with a real problem, as there was a dearth of native plants suitable for use as staple crops. The roots of the native species of tï and the aruhe, the root of the wild fern Pteridium esculentum, were partial supplements, and the latter became increasingly important as the population increased, even in places where kumara and taro grew comparatively well. However, the carefully prepared kernels of the karaka seem to have been equally important, their long-keeping qualities and ease of storage (as long as they were kept out of reach to rats) may have made them second only to kumara in importance in many places until the introduction of the potato at the end of the eighteenth century. Its importance is underlined by the widespread belief that the karaka was brought to Aotearoa from Hawaiki, "te karaka i ruia mai i runga i Rangiätea" (the karaka which was sown on Rangiätea, i.e. which came from the ceremonial centre of Eastern Polynesia at Ra'iatea, about 200 km northwest of Tahiti). However, the evidence is overwhelming that it was carried from the Taitokerau (Northland and Auckland regions) to other parts of New Zealand, along with the Chatham, Kermadec and many other offshore islands, where it was planted in groves close to settlements. The appearance of the tree is quite reminiscent of the Planchonellas (Pouterias) in the Islands, and even there cognate names in some places have been applied also to other species with large leaves and conspicuous, brightly coloured fruits. 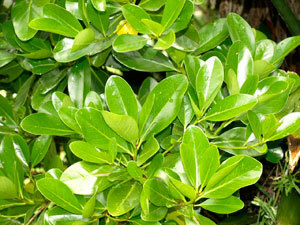 The karaka is a striking canopy tree growing to about 15 metres high, with glossy green oval leaves 15 cm or more long. It flowers in the summer and the distinctive aroma of the ripening fruits is an evocative sign that autumn is at hand. The nectar seems to be potentially toxic to bees at a certain point in the season (or at least acts as a powerful narcotic on many of them), but any potential toxicity vanishes quickly even when those that return to the hive add it to the honey. Ki te kainga weratia te karaka, ka roria. Te anga karaka, te anga koura, koi kitea i te marae. 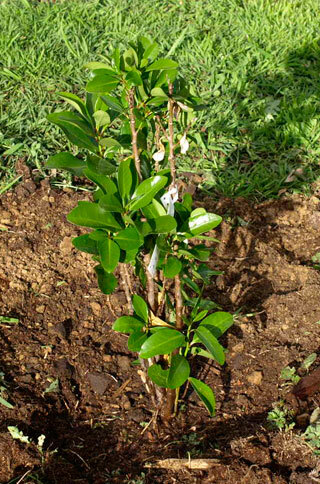 Some Oceanic and Polynesian precedents for the way the karaka berries were prepared are discussed on the linked page for the Proto-Polynesian word and the plants it referred to. The fruit of the karaka when steeped in water (and in some places the tree itself) was known as köpï, possibly a word brought from Rarotonga (where it refers to some varieties of ginger), and the kernels of the nut when it had been prepared for eating were known as köpïa. It is quite possible that the name köpï was given to the whole tree by people aware that it was not, in fact, one of the Planchonellas. The significance of the karaka was underlined in 1960, when it replaced the traditional image of the sovereign on the one penny stamp. Note: The species originally given the name from which karaka is derived, Planchonella costata, is also native to Aotearoa, but received a different name here. See the page on the Proto Polynesian name *kalaka (link at the top of this one) for more information. 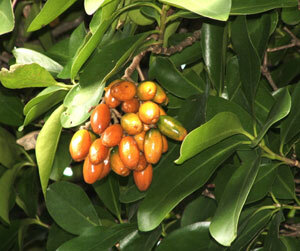 The processed fruit of the karaka is known as köpï, a name for the Polynesian ginger in Rarotonga. In some districts and the Chatham Islands the whole tree is given this name. Reference: There is a definitive account of the distribution of the karaka in Christopher Stowe's thesis "The ecology and ethnobotany of karaka (Corynocarpus laevigatus)", MSc., University of Otago, 2003, summarized in Helen Leach and Chris Stowe, "Oceanic arboriculture at the margins -- the case of the karaka (Corynocarpus laevigatus) in Aotearoa". Journal of the Polynesian Society, Vol. 114, No. 1, March 2005.